Now that you've set up and launched your campaign, it's time to see how it's doing. This article has a lot of information, so feel free to jump to any steps using the below links. Begin by logging into the console with your username and password. Use the sidebar menu on the left of your screen to select "Campaigns." Click on the campaign you wish to review. Your data will show up on the graph on the right side of your screen. You can change the range of data show by click on the 7-, 30-, or 90-day options in the top right corner of the reporting box. You can access lots of data from your Cliques Campaign using the console. Here are some pointers on how to do that. We're all about transparency here at Cliques: we want you to know as much about your campaign as we do. So yes, of course, you can see how you're doing with individual publishers! Right now we offer your current spend per publisher, the number of impressions you've won with them, your win rate for bids for that publisher, and your CTR. Wow! 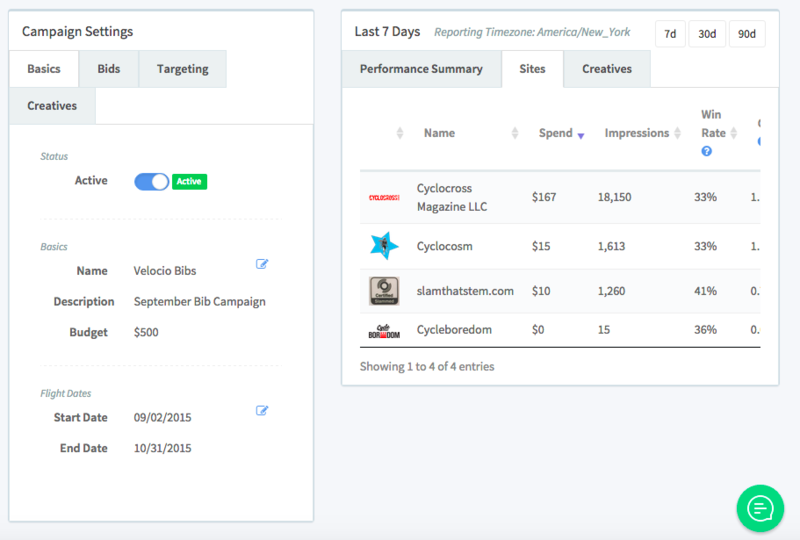 Click on your campaign, then select the Sites tab on your Campaign Summary. All your data will show up, and don't forget that you can scroll to the right to see more about your performance. Click on the "Creatives" tab in the Campaign Settings box. 5. Then switch to the DoubleClick tag. 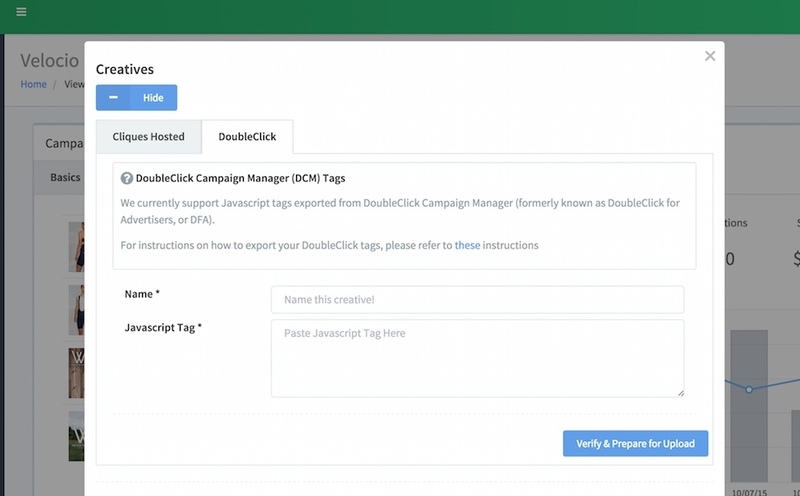 You can find instructions on exporting the DoubleClick tags here! 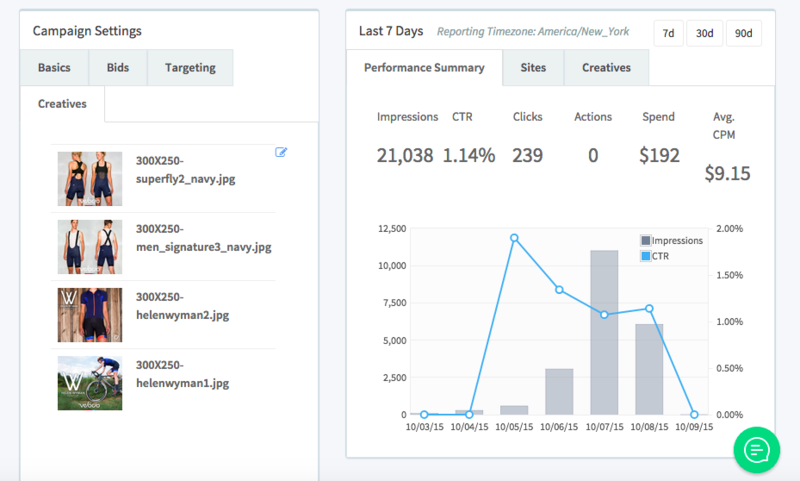 This section explains how to create and export a code for a tracking pixel, which allows you to better understand and analyze how your campaign is performing and what kind of reach it has. If you're looking for information on what a tracking pixel is, try this article first! 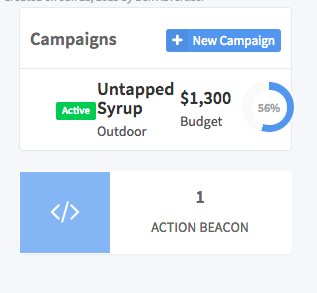 When you click on your campaign, you'll see a blue and white button that says how many Action Beacons you have installed. This number should be zero if you haven't made one already! Click that Action Beacon beacon button and you'll be prompted to create a new one. From there you can click on your new Action Beacon, press "Get Code," and install it on your page. That's it! 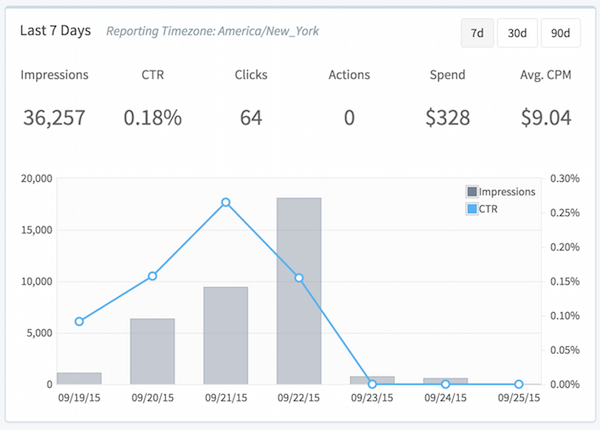 Your data will show up on your campaign quick stats (the graph on your campaign pages). This space only keeps track of the impressions or clicks we've served for your campaign that made it to the webpage you placed the pixel on. If this number is 0, check out this article instead! There are two common ways to measure the success and return on investment (ROI) of a digital, conversion-focused campaign: Click Through Attribution and View Through Attribution. You can view both in the Cliques Console. The following article explains how each metric is measured, and briefly discusses the pros & cons of each as it relates to measuring ROI. Say you're advertising backpacks for back-to-school month. In those 30 days, you spend $10,000 on ads. During that same month, 1,000 people each buy one backpack from your store online at a price of $100/backpack ($100,000 total revenue). However, 500 of those people were never exposed to your ads. Of the remaining 500 who did see an ad, 50 clicked on an ad prior to buying a backpack. The other 450 had only been served an impression—but they didn't click. How do we know? Because our action beacons are installed on their order confirmation page! In this simplified example, however, we know the exact revenue attributable to each conversion, which allows us to calculate an exact ROI. In reality, this may be harder to pinpoint for a number of reasons, which is why people generally use CPA numbers as a proxies for ROI. Just remember that if CPA is lower, ROI is higher, and vice versa. View-Through and Click-Through CPAs: Pros & Cons. Summary: View-through attribution gives a more holistic view of the success or failure of a campaign, but can give a campaign more credit than it's necessarily worth. 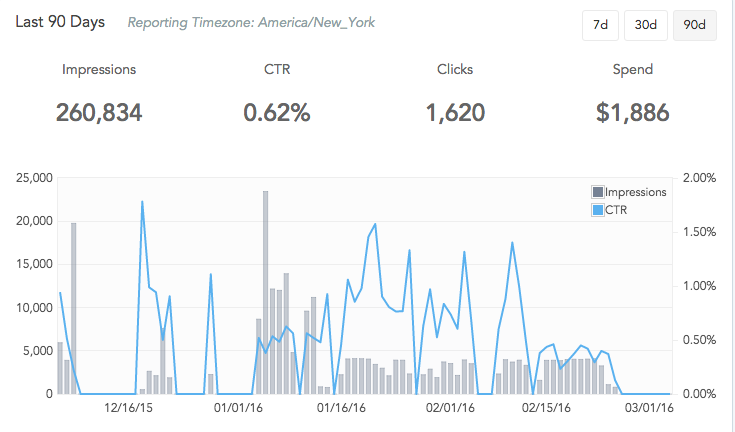 Click-through attribution is less forgiving and more precise, but can be misleadingly harsh. View-through gives you a broader sense of the success of your campaign because seeing an ad, even if a customer doesn’t always click on it, reinforces the prevalence of your brand and products. If you are running multiple campaigns with different creatives (or, for that matter, any changed variables), looking at your view-through numbers can also tell you if one campaign is has a broader reach, and, if your variables are controlled, why. The biggest con of view-through is that you can never be sure if eventual conversion was provoked by the ad you showed. In view-through, there is no way to be sure that a customer even saw the ad—perhaps they ignored it. There’s also a chance that they might have seen the ad, but it didn’t happen recently enough (for Google analytics, it has to be within 28 days), so their purchase is technically attributable to your ad, but technology doesn’t know that. Click-through attribution is much more black and white: either the ad was clicked on or it wasn’t. With view-through conversions you never can be completely certain if a consumer’s action was spurred by your ad, but with a click-through conversion there's very little room for doubt that your ad influenced that conversion. But as you're likely aware, relatively few people click on ads, and even fewer people buy something shortly after clicking. Thus, click-through CPA's will generally be substantially worse than view-through CPA's, and does not account for anyone who was influenced to convert by seeing your ad, but did not click. Best Practice: Set a lofty goal for your View-Through CPA, and a very forgiving goal for your Click-Through CPA. Most of your conversions will not come from clicks, but it's important to make sure that handful do to validate your targeting and overall campaign strategy.